In September 2006, hospitalization and a shock diabetes diagnosis inspired author Marc Zeedar to radically change his lifestyle. Within six months Marc lost 75 pounds, got off all his diabetes medications, and restored all of his blood chemistry (cholesterol, triglycerides, glucose, etc.) to normal. He is now healthier than he’s been in decades. Learning to eat healthy, Marc discovered “diet” does not have to mean smaller portions and no flavor. 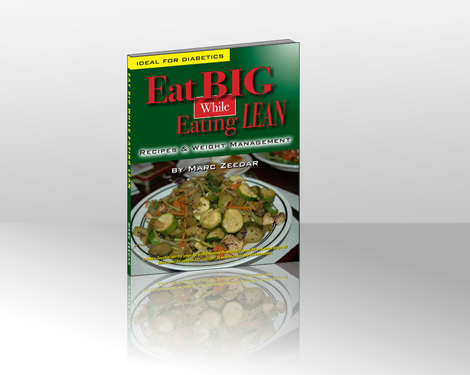 This book is a collection of advice, tips, and recipes on how to lose weight while eating huge amounts of healthy, delicious foods. You can view the book's Table of Contents online, and download a sample chapter here.